Reading for pleasure is all the rage in schools, but how often do we, and the children we teach, read for displeasure? Or, perhaps more accurately, for discomfort? Ask any number of readers what they like about reading and there will be plenty of replies on the theme of escapism. Internet memes carry lines such as "Books: a cosy doorway to paradise". Actually, for many, it should be that books are a doorway out of a cosy paradise. Note: This article does not cover the whole range of uncomfortable life situations that people find themselves in. I have focused in this article on issues such as loss (of a loved one, of a sense of safety, of a sense of community) as well as racism. It is by no means a definitive list. 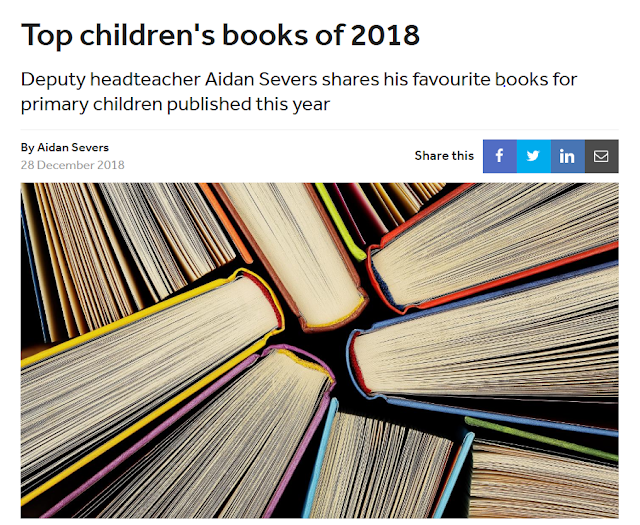 I would suggest that there could be plenty more articles submitted to the TES highlighting books that will help children to understand other life circumstances. In my blog post Reading Roles PLUS Generic Reading Activity I presented a reading activity which focuses on some of the widely-accepted reading comprehension strategies. Where possible I like to exemplify things that I write about, so that's what this blog post is. Context: A small group of boys (not sure why, just was), end of year 3 but working below age related expectations, reading Fantastic Mr. Fox (their choice). We began with the Student Reading Role which matches the reading comprehension strategy of clarifying. After reading through the text the children wrote down words and phrases they didn't know the meaning of. This felt like a bit of a dry start, but without understanding key vocabulary it isn't easy to comprehend a text. The children identified some words but missed many other words which in later discussion they admitted to not knowing the meaning of. Part of training children in this seems to be allowing them to be honest, or encouraging them to think more deeply rather than just skipping over words they don't know. I then shared a pre-made PowerPoint which contained the words I anticipated the children wouldn't know. Some of the words (mainly nouns) were accompanied by pictures, others had a child-friendly definition. We then moved on to the Quiz Master Reading Role. 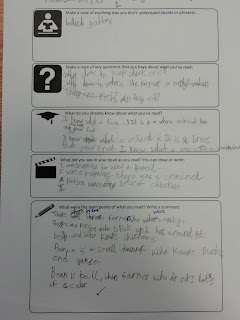 I modelled some of the sorts of questions they might want to ask whilst reading. We then read the text again giving the children another exposure to the text and allowing them to focus on the new strategy. Not all the questions generated were that insightful but others were: How come they were mean men? Are they rich? I'd say these ones were because they are linked to main principles of the story. The answers to some questions were perhaps best avoided: Why does he drink so much cider? It was clear that the children were not used to asking questions of the text - all the more reason to make them aware of this strategy. The fourth part of the session was to focus on the Movie Director Reading Role. 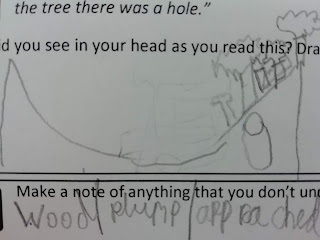 This required children to draw or write about what they saw in their heads as they read. 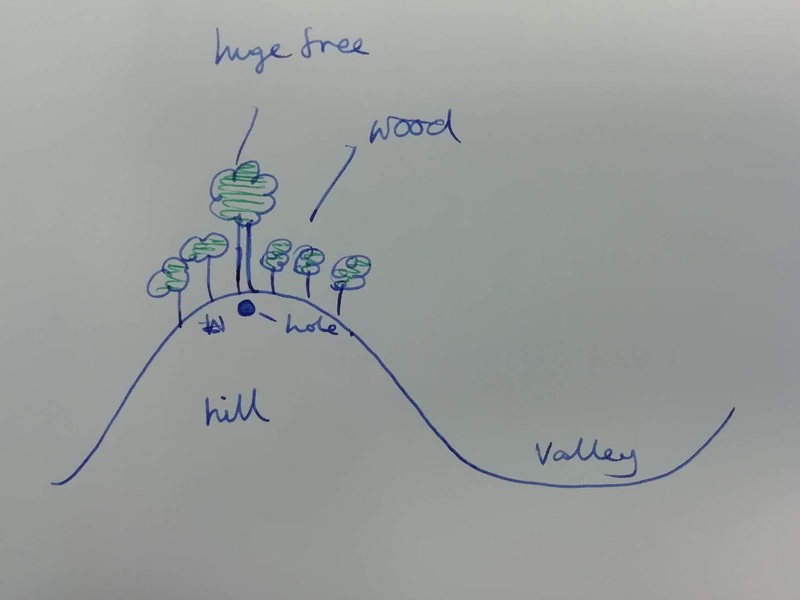 I quickly realised my mistake in asking them to do this: you can't draw or write about what you visualised whilst reading a whole chapter! The children focused on parts of the text that were not main points of the story. Lastly, we looked at the Editor Reading Role which focuses on summarising. Together we developed 4 points which we thought might be important to remember as the story moved on. We discarded facts that we thought might not be crucial to the narrative. I gave them a three-sentence quote describing the chapter's setting: "On the hill above the valley there was a wood. In the wood there was a huge tree. Under the tree there was a hole." Had this activity not have come first, I wouldn't have discovered that one child didn't know what a wood was. 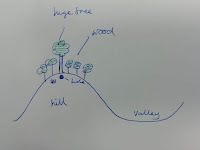 Actually when he read the word wood, he imagined a rectangular piece of wood (see the picture, left, where you can make out his rubbed out rectangle of wood which is incorrectly placed in the valley rather than on the hill). 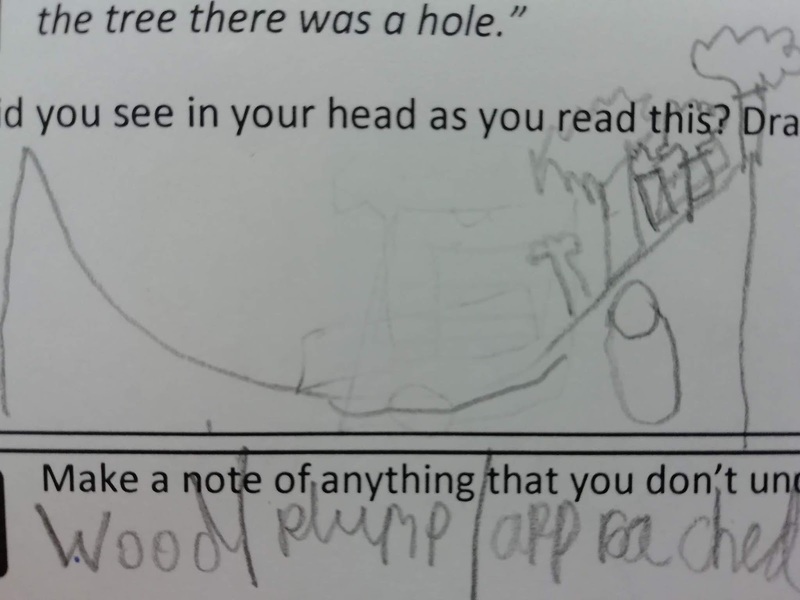 This probably wouldn't have come out in the Student/clarifying activity as he believed he knew what a wood was (although if he was properly clarifying he would have realised that in this context the sort of wood he had in mind didn't make sense). 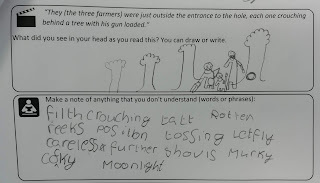 Once the children had done their own I completed my own drawing as a model to them and used it to explain any inaccuracies (particularly relating to positional language/prepositions) in their own drawings. We then read the chapter again and the children made a note of words that they didn't understand (Student Reading Role: clarifying). As well as the pre-made PowerPoint (see session 1) we did some quick vocabulary activities: can you put that word in your own sentence? Can you act that word out e.g. Can you approach me? With the word plump, we also had a chance to discuss an inference question: why would the farmer want a plump chicken? Completing the Professor Reading Roles this time made me realise the need to reconsider how this section is tackled. Children worked at quite a basic level saying that they knew what things were e.g. hill, valley, geese, turkey. The way the prompt was worded did not really engage children in thinking about wider concepts of the text, or facts that they already knew beyond word meanings. On reflection this is an area of practice that I need to think and read more about. My question: how do we go about helping children to activate their prior knowledge? Does it need to focus more on when there is something they don't understand? When working on the Quiz Master Reading Role the second time round I noticed that my modelling and prompting was centred around a more generic overall question: what do I want to know? Many of the questions the children asked were surrounding information that the author had chosen to leave out as it wasn't important enough to the story: how did Mr Fox get the animals? How did the farmer find the fox hole? The questions that I guided the children towards asking were more about things that might happen as the book progresses: how will Mr Fox get his food now? Will the farmers succeed in killing the foxes? These kinds of question are the kind that skilled readers ask all the time as they read. Other questions may also link to the act of clarifying in the case of information that is included in the text but is not understood on the first reading. It may be worth creating a list of exemplar questions to help teachers and children to practise this strategy. Completing the summary activity (Editor Reading Role) after doing the other sections of the activity certainly seemed to help the children - after reading the text several times, clarifying their understanding and engaging with the narrative by asking their own questions about it and visualising parts of it the children readily picked out the main points and sequenced them. In my experience children don't always find it easy to prove in this way that they have good comprehension of a chapter as a whole. The children completed the visualising (Movie Director Reading Role) task quite slowly during this session but it did provide lots of opportunities to discuss the text which is always welcome as it is the discussions more than what is recorded that demonstrates and develops the knowledge and understanding. However, on the whole, this is probably a part of the session that should eventually happen quite quickly. Rather than have the children record words individually for the clarifying activity (Student Reading Role) they all added to their lists as we read together, often as a result of prompts from me or another child. I found that asking if they understood particular words made them more honest about words that they didn't understand. As a result of this, we discussed a lot more vocabulary than we had in previous sessions, sharing new definitions and images of nouns on the pre-made PowerPoint, using the words in sentences and so on. It is this that is so crucial: if children do not understand the meanings of individual words then they will struggle to make meaning of text constructed using those words. On clarifying: it is important that children feel like they are allowed to ask, and that it isn't a bad thing to not know what a word means, if they are to begin to automatically clarify when they read. Too often I suspect that children skip over words they don't understand simply because they are afraid to admit it. A culture of 'it is O.K. not to know yet' must pervade if children are to improve. As we read I noticed that the children were beginning to ask questions of the text (Quiz Master Reading Role) without the prompt on the sheet. As they asked, I reminded them to record them on their sheets, and we discussed the possible answers to their questions before moving on. 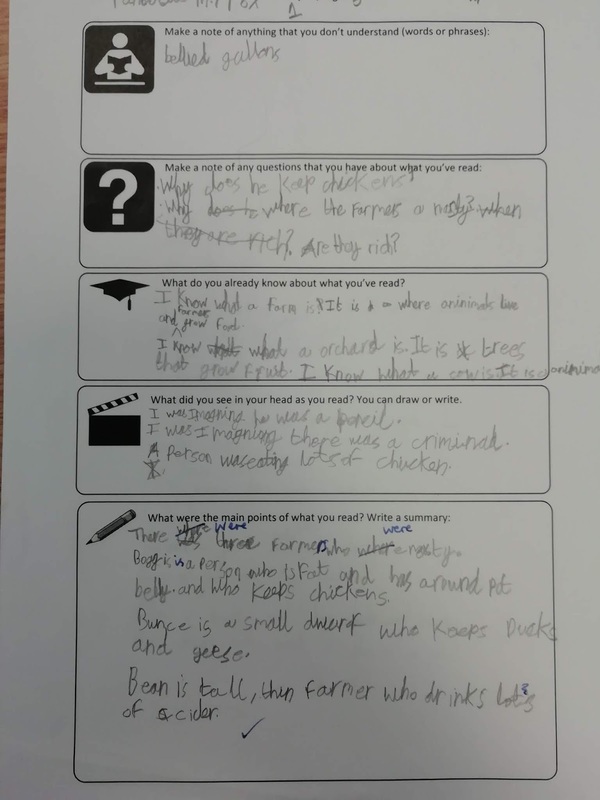 During these discussions we were also able to bring in snippets of prior knowledge which helped us to answer our questions - it may be that the Professor Reading Role doesn't benefit from any sort of recording but just needs to be brought in to discussions. It would seem that even after only three sessions the children began to use the strategies more readily: they were particularly more open to questioning a text as they read it and they became more enthusiastic about learning what the words meant. It was as if in practising the strategies and as a result understanding the text better, they became more keen to use the strategies again - perhaps because it helped them to understand and enjoy the story better. They certainly improved their ability to write a summary - this probably as a result of such a deep dive into the chapter with repeated reading. Do they actually have relevant background knowledge in the first place? Are they deliberately searching their background knowledge when they come across something they don't understand? If you have any experience of working with these strategies, or even have tried out the Reading Roles relating to them, I'd love to find out what you've done to help children develop their use. Please point me towards relevant reading or share some examples from your own practice, either in the comments section, or on Twitter or Facebook. Reading Roles PLUS is a resource designed to aid children’s metacognition when reading. Metacognition can be defined simply as ‘thinking about thinking’. Reading Roles PLUS takes familiar job titles and assigns them to reading strategies and skills thus giving children an easy-to-refer-to system for being more deliberate with their thinking during reading, with the ultimate goal of being able to comprehend texts. Alongside the job title (or role) there is a symbol which can be used as a further way to prompt certain kinds of thinking – some children may find these easier to remember. For more information about Reading Roles PLUS please visit my blog post 'Reading Roles PLUS: Teaching Metacognitive Reading Comprehension Strategies'. Director The director uses words and makes them into pictures and moving images. Focus: visualising. 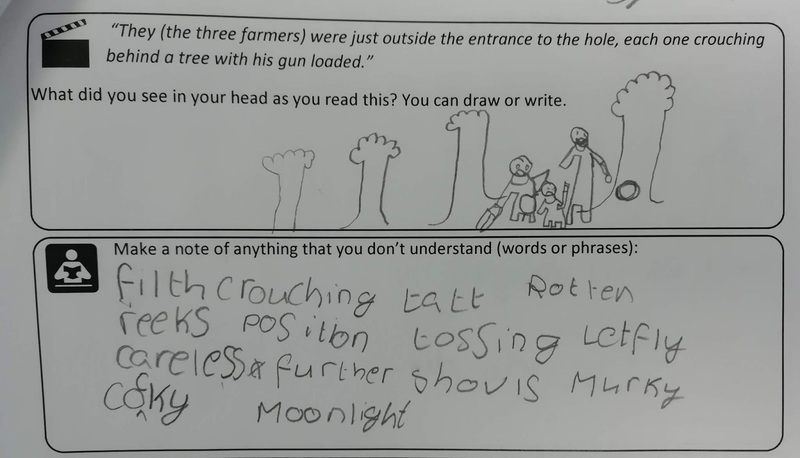 Pupils make mental images of a text as a way to understand processes or events they encounter during reading. Student The student knows that they don’t yet understand everything and they work hard to make sure they understand new things. Focus: clarifying/monitoring. Pupils identify areas of uncertainty, which may be individual words or phrases, and seek information to clarify meaning. Professor The professor thinks about what they already know and uses the information to help them understand new things. Focus: using background/prior knowledge. 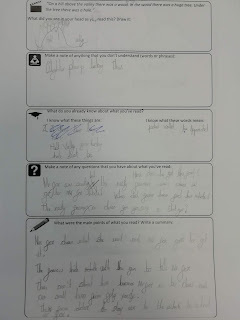 Pupils think about what they already know and make links. This helps pupils to infer and elaborate, fill in missing or incomplete information and use existing mental structures to support recall. Quiz Master The quiz master asks lots of questions. Focus: questioning. Pupils generate their own questions about a text in order to check their comprehension. All of these Reading Roles are based on widely-accepted reading comprehension strategies. For example, they are featured in the EEF's Improving Literacy in Key Stage Two Guidance Report where research supporting this way of teaching is judged as being extensive. 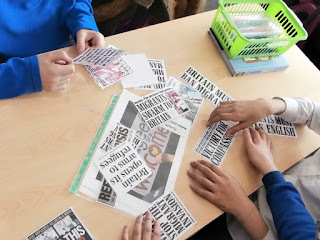 The aim of this activity is to help children gain a better understanding of a text. It focuses on using 5 of the main widely-acknowledged reading strategies. Although the activity itself has a goal of enabling understanding of one text, the cumulative effect of doing several of these activities is intended to be that children begin to use these strategies automatically when they read any text. The activity and guideline sheet can be downloaded for free on the TES website. This activity is probably best used with a small portion of text: probably no more than 4 pages, but more ideally, in a longer novel particularly, a double page spread. Children unfamiliar with the roles of Director, Student, Professor, Quiz Master and Editor will need these explaining to them one by one. It might be a good idea to focus on one role/strategy per reading session to begin with to help children to understand the different reading strategies. Once children are familiar with the different roles/strategies it would be a good idea to read the text, complete the first box (Director) then discuss before reading the text again and completing the second box (Student) and so on. The first times of doing this may take quite a while! As the children get more familiar with the format they may cope with fewer readings of the text and may remember to make a note of, for example, questions they have (Quiz Master) or words they don’t understand (Student) whilst reading for the first time. 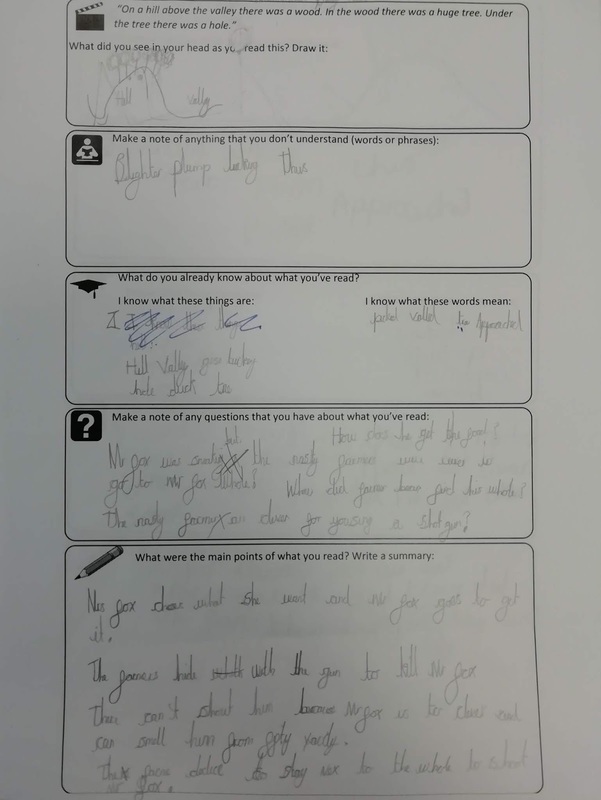 This is desired, showing that children are probably beginning to internalise the strategies of checking, questioning and so on. The activity could provide a format for a group activity where teacher records under the headings and children don’t have their own copy – this would promote lots of discussion. Equally, children could complete their own. Children could also complete these about their own book, or about a class book individually as part of an independent session. The activity is versatile. Before running the session it is worth going through the text and making a note of all the potential words and phrases that children might not know – a PowerPoint of pictures and definitions, for example, could then be created to share with the children if they identify those words and phrases as being ones they don’t understand. There will always be surprises though: things you thought the children would know but don’t. Use of this should probably be short term – once the strategies have been practised explicitly in this way, or in other ways, children should be using them automatically. Once embedded, deliberate repeat practise of strategies such as these is thought not to have any further impact. If children don’t appear to improve in their reading comprehension then they made need further intervention of another kind, potentially focusing on deeper issues such as decoding, fluency, vocabulary or background knowledge. Click here to see this activity exemplified. 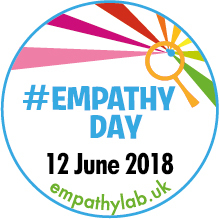 Last year for Empathy Day, organised by Empathy Lab UK, I recommended 6 books that encourage children to read for empathy: 'The Unforgotten Coat' by Frank Cottrell Boyce; 'Oranges in No Man's Land' by Elizabeth Laird; 'The Goldfish Boy' by Lisa Thompson; 'My Dad's A Birdman' by David Almond; 'Tall Story' by Candy Gourlay; and 'Noah Barleywater Runs Away' by John Boyne. Since then I've read rather a few more books that easily fall into the category of books that develop empathy in their readers. And with the second Empathy Day taking place on June 12th 2018 it seemed right to produce another list. Given that my last list contained no non-fiction, I'd like to begin by highlighting a few titles, which, whilst still narratives, tell the stories of real life people. Although open and honest about the difficult experiences of a child moving to a new country, this book is written in such a simple way that it is very accessible for young readers - I'd recommend it for emotionally ready year 3 children and upwards. 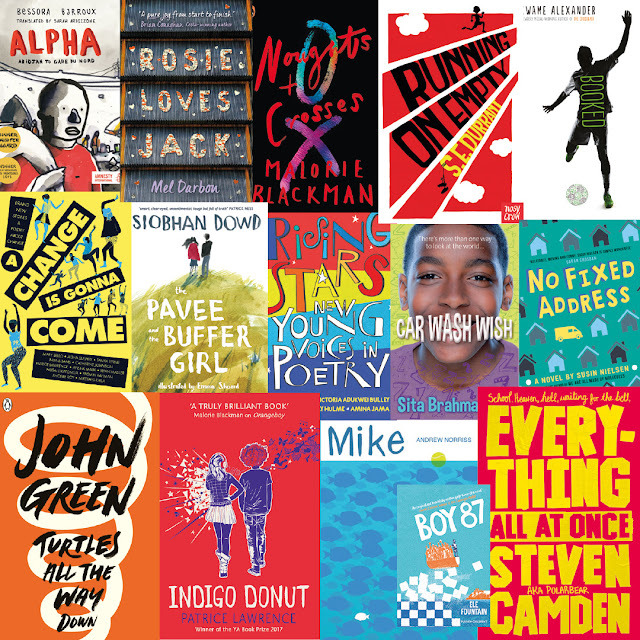 It is fairly hard-hitting - younger readers will definitely benefit from being able to discuss their reading with an adult - but is a great gateway to helping children understand how others feel when they arrive in a strange place where they experience prejudice and hardship. Given that this is a live issue for the UK it is important that children up and down the country understand as they help their new classmates to settle in. 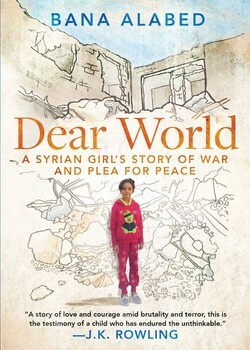 Another autobiography, this time written by then 8 year old Syrian Bana Alabed. Whilst still in Syria and experiencing firsthand the terrors of civil war in Aleppo Bana took to Twitter in order to share her story - her first tweet read 'I need peace'. As with 'Coming To England' this book is written in a simple way making it accessible to children the same age as Bana and upwards. It is a truly moving account - I admit to crying several times - and is the book I remember more than any others when I consider what I can do to help those fleeing such crises. People who seek refuge in the UK need to be welcomed by open arms, especially the children, and it is books like this that will help our children to resist the racist rhetoric that can be so pervasive and instead show kindness to those who are fleeing their homes. Presented in the usual non-fiction format that you'd typically find in a school library this informative book tells Malala's life story. It's both eye-opening and inspiring, and whilst being an obvious heroine for Muslims and girls there is encouragement to all our young people in the account of Malala's life. As with the previous two books, this volume explains carefully another reason why people might leaving their country in search of another life - to learn about the prejudice and oppression Malala faced from the Taliban in her own country should prompt children to assess their own attitudes towards women and minority groups. Set in the West Bank this short story explores how Jewish and Palestinian children live in the shadow of the wall and the war that divides them. Contains such a tingle down the spine moment that this is absolutely essential reading. This is a story that will begin to give children an idea of the unrest that goes on overseas, as well as an idea of how this affects children such as themselves. This is 'The Kite Runner' for children. Death. A tricky, tricky subject for children's books. From my review: "Ventrella cleverly explores the very real experience of how mixed emotions come into play during the loss of a loved one. The skeleton is funny (there are laugh-out-loud moments) and he brings some light relief to what is otherwise a very sad story... The book may help some children to explore the emotions felt during a bereavement." 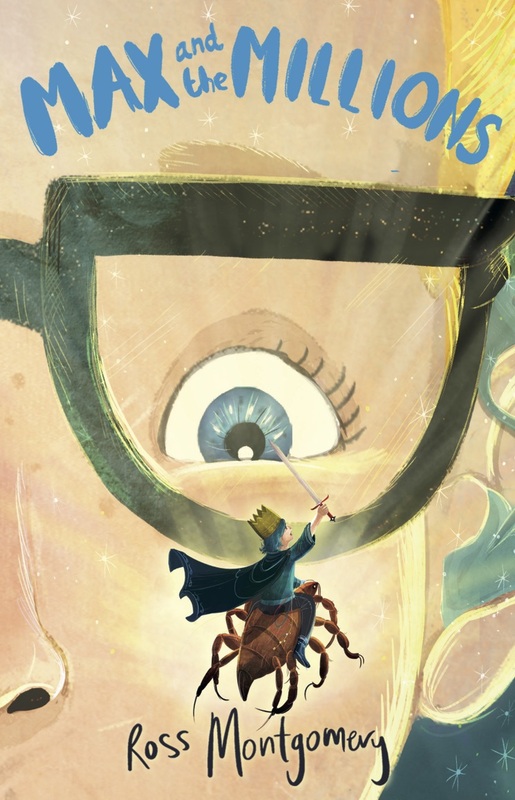 This book tackles a rare subject in children's literature: domestic abuse. From my review: "'The Light Jar' is a book that digs deep into human emotion, validating the gamut of thoughts and feelings that children the world over will feel on a day-to-day basis. And with all the current news of young people's mental health issues, books like these are crucial in normalising and validating the responses our children have to difficult life circumstances; 'The Light Jar' will provide illumination in the darkness of some of its readers' lives." From my review: "Sky Song is an important lesson in why tribalism, whilst comfortable, will not save the day - a political message that might give children a starting point to thinking about what their role on the world stage might be. 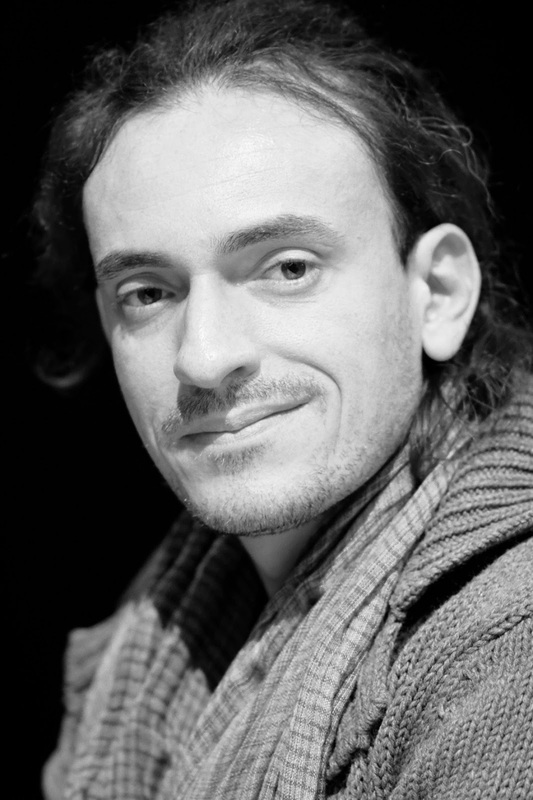 Flint's character provides hope that people can change their ideological views in order to become more mindful of others. The character of his sister Blu, based on Elphinstone's own relative who has Down's Syndrome, is also a possible discussion starter for readers to explore and change their thoughts about those with genetic disorders and resulting learning difficulties." The Wonderling is an Oliver Twist-style adventure with, er... a twist. It is set in a world inhabited by humans, animals and humanoid mixed-breed creatures - foundlings - who are despised by the others. It focuses on the adventures of one such orphan foundling as he escapes the workhouse in order to discover who he really is. This book is a great starting point for empathising with children of the Victorian era who suffered in poverty but it also has modern parallels to children still living in similar situations all over the world. This difficult yet compelling read is a great dystopian exploration of the gap that exists between rich and poor and as such would be a good way to help children feel empathy for children and adults les fortunate than themselves. From my review: "The subject of domestic abuse – both physical and emotional, towards adults and children – makes this a tough read in places, particularly for the aforementioned age bracket. I would suggest that this book is better suited to teenage readers for this reason." From my review: "Despite this looking like a funny book, it actually tackles quite a serious subject matter – so much so that I actually almost had a little cry at the end... It ends up as an exploration of loneliness and old age and is a gentle reminder to any reader to value all members of society, especially those at risk of becoming marginalised. This aspect of the book makes it fully rounded and a perfect read for anyone in lower key stage two..."
Featuring a Syrian refugee and a girl experiencing severe domestic issues this book is a must-read for upper key stage two children. From my review: "This is a book that I wish every child would read. Politically and socially our children need to be living the out the story in this book if the world is going to have any sort of peaceful future. The book's dual message that differences ought to be celebrated and common ground should be sought is too important for this generation to miss out on. 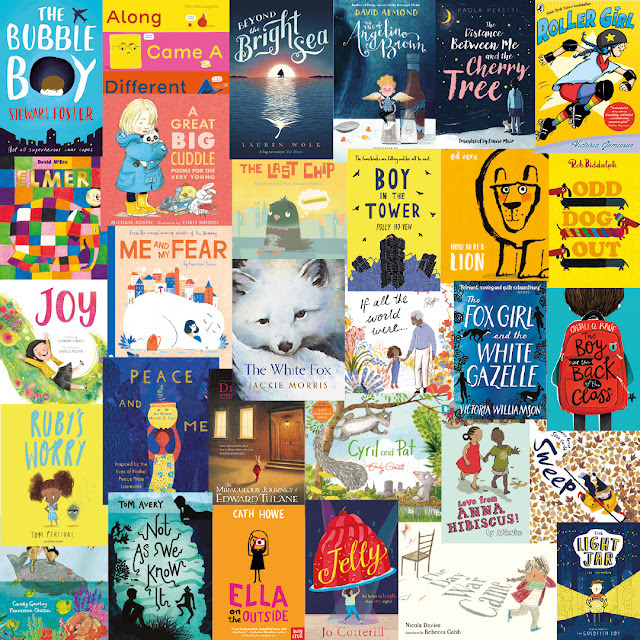 Books such as this are a safe space in which to explore the everyday issues that children might face - we must get these books into their hands." This is book about how a child deals with the illness of a parent. It also features a positive-thinking wheelchair user and a whole lot of kindness and hope. 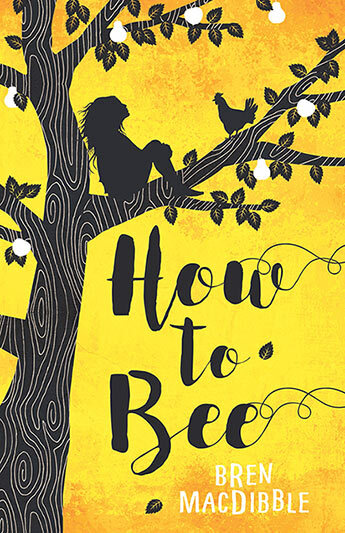 From my review: "In this beautifully-written story debut author Ewa Jozefkowicz deftly explores issues that young children may well come up against in real life. 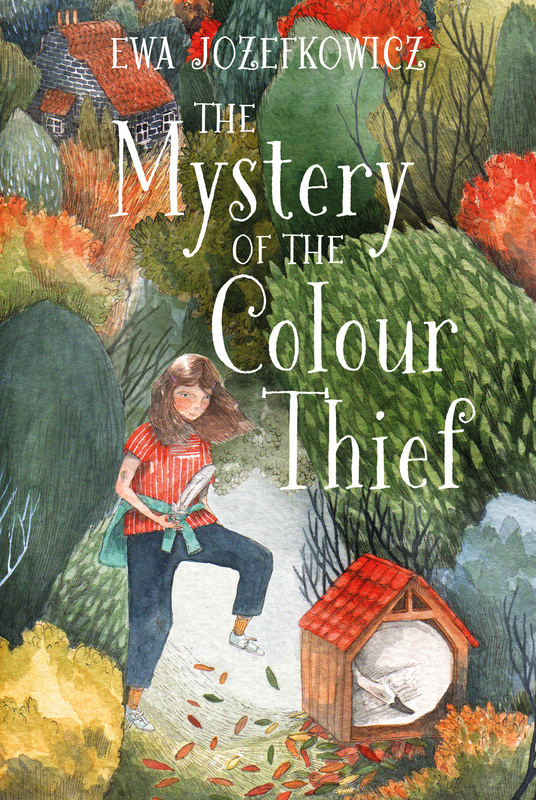 'The Mystery of the Colour Thief' will bring comfort to those with similar experiences to those portrayed and will help those who haven't to be that little bit more understanding of those who have." As Andrew Donkin explains in his guest blog post for me: "We wanted to show our readers the situations that Ebo and Kwame find themselves in and invite our readers to imagine how the brothers might be feeling. We wanted to ask our readers to empathise with them and to imagine how they would feel in their place." 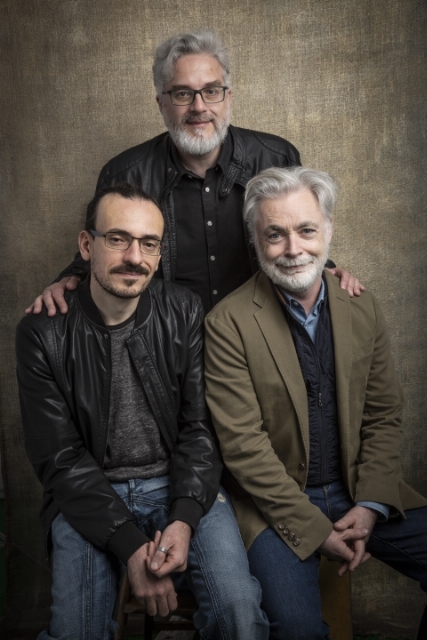 From my review: "Rather than seeking to cash in, as the media did for a while, Eoin Colfer, Andrew Donkin and Giovanni Rigano seek to humanise the stories from the news reports. Human beings respond well to narratives and by telling the story of Ebo and Kwame, two brothers attempting to make it from Africa to Europe, the creators of 'Illegal' succeed in making real two of the nameless, faceless victims of whom we read in our newspapers." From my review: "Max loves making models; he’s also deaf. This representation of a ‘minority group’ is important in children’s literature. Montgomery writes sensitively and convincingly about the trials a deaf child might face making this an important lesson in empathy for young readers... [children will] be caused to think about how first impressions don’t always count, how kindness and selflessness are key characteristics to develop in oneself and how forgiveness is an essential ingredient for peace and friendship." Our new graphic novel, ILLEGAL, started life with a desire to make our readers feel empathy for people in a very unusual and terrible situation. It was about four years ago and my co-writer, Eoin Colfer, and I were following postage stamp-sized reports about the sinking of boats full of would-be migrants trying to cross the Mediterranean Sea. The reports were short, impersonal, and just carried an approximate number of people thought to be missing or dead. It made for grim reading. We followed the story and dug deeper. When you read a report that says “It’s believed that 217 people died in the sinking” it’s very easy to get lost in the numbers. What do 217 people look like? How many classrooms would they fill? Or how many double decker buses? It’s easy to forget that each one of those 217 is a person just like me and just like you. These days, everyone has seen the photographs of the so-called “cathedral boats” where every single inch of deck space is packed with a human being desperate to escape their old life or to begin a new one. As I said, it’s easy to get lost in the sheer numbers, and what we wanted to do with ILLEGAL, was to take one person on that dodgy, unseaworthy boat and tell their story. We figured that if we could make our readers feel empathy for one person in the boat, then that would perhaps change the head-numbing statistics into human beings. ILLEGAL follows the story of two brothers, Ebo and Kwame, as they leave their home and attempt to travel across the Sahara Desert towards the northern coast of Africa where they eventually put their lives in the hands of people traffickers on a boat to Europe. 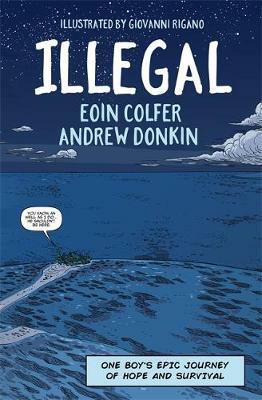 From the very beginning we knew that we wanted to tell the story of ILLEGAL as a graphic novel rather than a more traditional prose novel. One of the many reasons for this was that we wanted to avoid telling the readers how our characters felt. We wanted to show our readers the situations that Ebo and Kwame find themselves in and invite our readers to imagine how the brothers might be feeling. We wanted to ask our readers to empathise with them and to imagine how they would feel in their place. 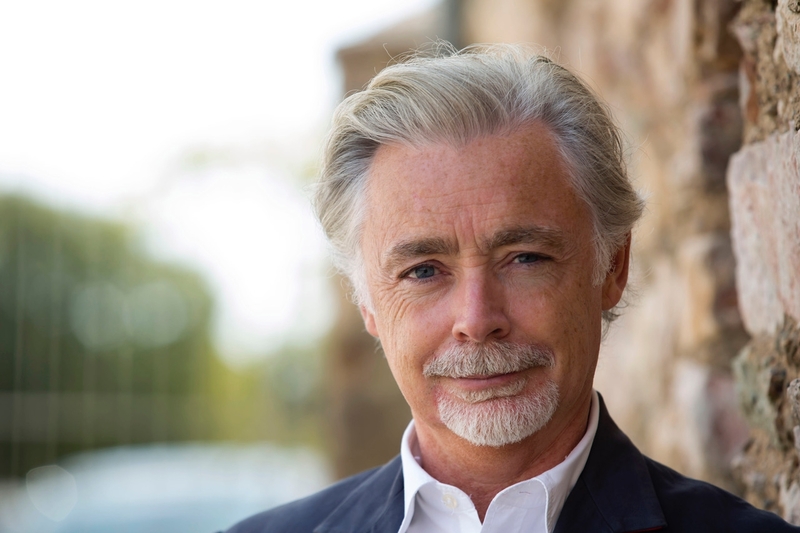 My friend and co-writer, Eoin Colfer wrote recently that “travel broadens the mind, but books broaden the heart.” That’s never been truer of a book than the experience of reading ILLEGAL. Nobody would want to undergo the terrible journey that our characters undertake, but by reading the book in the safety of your own home or school or library, a reader can perhaps take away a small piece, perhaps if we’re really lucky, one-millionth of the real life experience. In many ways the job of a writer is feeling empathy for a living. How else could writers get inside the head of their many and varied characters to pen their tales? Writing fiction is a strange alchemy of sometimes transposing your own experiences into the head of other characters, but more often putting your characters in situations you’ve never experienced yourself. For ILLEGAL, Eoin, myself and our artist Giovanni Rigano did more research than for any other book that we have ever published. Although the story is fictional, every single bit of it is true. Every bit of it happened to someone – usually to many people. Meeting and listening to the survivors of such journeys was a moving and humbling experience as we worked on the book. The last few years have seen several very divisive political events and movements sweep across the west. It seems to me that books and graphic novels with their ability to transport you not just across time and space, but more importantly into the experiences of another human being are more vital than ever. 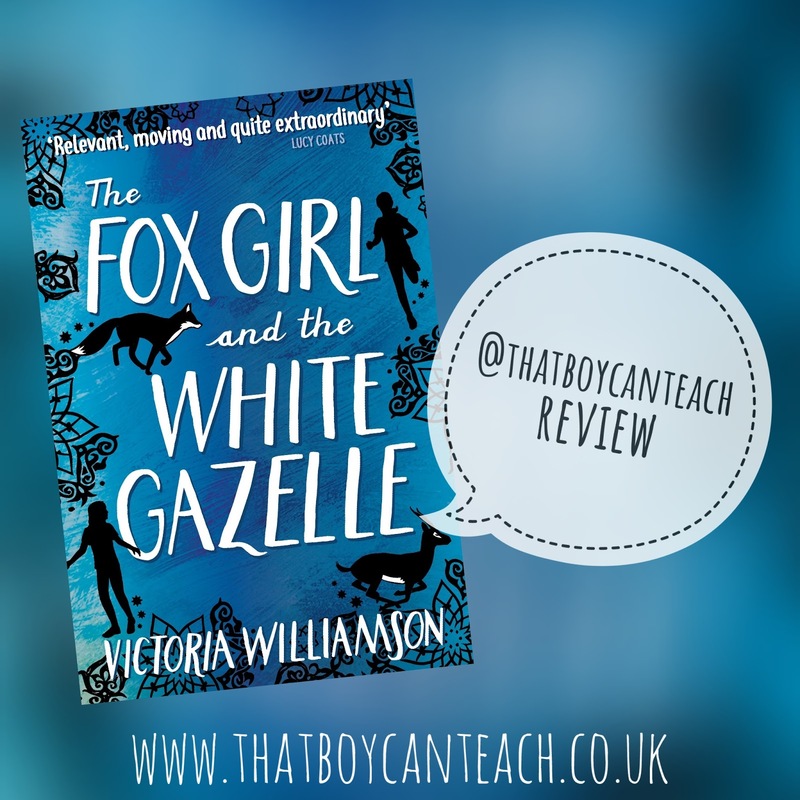 In today's guest blog post, and as part of her blog tour, Victoria Williamson, author of 'The Fox Girl and The White Gazelle' (see my review), discusses how stories can help children to understand things from the perspective of others. In her own book the story is told by two characters, each with their own point of view on the same events - this device is a helpful way into exploring how different people see and interpret the same events differently. In a world of competing twenty-four hour news channels, adverts and infomercials that stretch the definition of truth, scientific data sponsored by self-interested corporations, and ‘fake news’ pedalled on Facebook and Twitter with countless celebrity ‘likes’, how do we separate the fact from the fiction, the objective reality from the subjective opinion? Learning to sift through all of the available sources and select the most reliable ones is a vital skill for students to learn. One of the best ways to introduce them to this is through fiction. Children’s books are full of unreliable narrators, characters who see the world only from their point of view and get things wrong as a result. 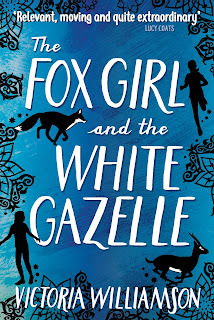 Caylin and Reema in The Fox Girl and the White Gazelle are no exception. Seen though Reema’s eyes, Caylin is a mean school bully, a talentless thug and an untrustworthy thief with no redeeming qualities. From Caylin’s point of view, Reema is a foreigner who speaks a strange language and eats weird food, an outsider she couldn’t possibly have anything in common with. At first their own prejudice colours every interaction, to the point where they experience the same events in completely different ways. I have won. I have proved to them all that I am the White Gazelle, and I am fast. Caylin may be faster than me over a short distance, but that is alright, because I am stronger. I will always outrun her in the end. I totally beat her. If Miss Lindsey hadn’t made us run a stupid marathon instead of a straight race then I would’ve crossed the finish miles ahead of Reema. It wasn’t a fair contest. [...] As long as I know I can outrun Reema, that’s all that matters. 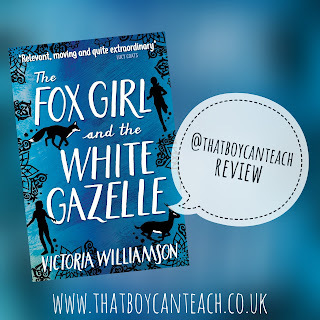 It’s only when the two girls overcome their initial mistrust and start to work together to look after the family of foxes in the back yard of their apartment building that they realise they’re not so very different after all. It’s only by sharing their experiences with each other, and looking at the world from the others’ point of view, that they come to see the whole picture. When discussing refugee issues in the classroom, the ‘whole picture’ exercise is a very useful one to get students thinking about who is being allowed to tell the story, and whose point of view is being left out entirely. I ask groups to look at a picture that is half covered with paper, and ask them to describe what they think the other hidden half looks like. The most useful picture for this exercise is the Reuters photograph by Jose Palazon showing golfers on an expensive course in Spain on one side, while migrants attempting to make it across the Spain-Morocco border to start a new life in Europe are seen climbing the high fence in the background. When the background is covered and we only see the point of view of the golfers, it looks like a beautiful, tranquil scene on a plush course lined by palm trees. Only when it is seen from the point of view of the migrants perched precariously on top of the fence does the difference in wealth, situation and life chances become clear. This exercise is a great introduction to further activities looking at newspaper headlines and news stories. Who is telling the story? Is it written from the point of view of a resident of that country or a displaced person seeking a refuge? Is it sympathetic or hostile? Is the story being told with empathy, or is it exploitative, full of click-bait headlines and inflammatory phrases to draw readers in, regardless of the dehumanising effect this has on the people being described? As teachers we need to ensure that students have access to a wide range of sources in our classes that describe historical and current affairs events from all points of view, not just the mainstream or ‘accepted’ version. As authors, we have a duty to represent a range of different characters and voices in our books, and not always default to writing characters just like us whose life experiences mirror our own. The ability to empathise with others may be something we are all born with, but like most skills, it has to be nurtured and practised. It’s only by seeing the world through the eyes of others that we get to exercise this important skill fully, and reading fiction with a diverse range of characters and voices is one of the best places to begin. 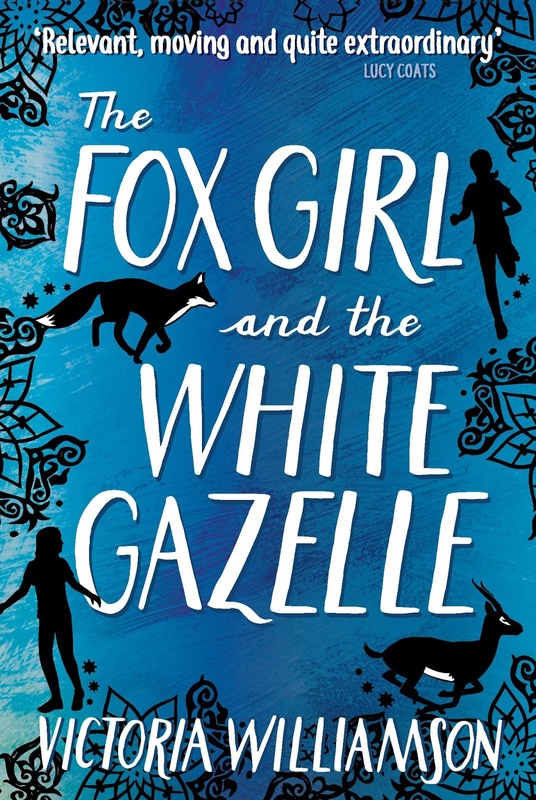 'The Fox Girl and the White Gazelle' deserves to be one of 2018's most lauded books. Tackling racism, discrimination and bullying head-on in a book aimed at upper primary children is no mean feat, but Victoria Williamson does it with great sensitivity. Reema and Caylin both have their back stories. One is a refugee from Syria, the other lives with her alcoholic mum and is the school bully. Reema pines for home, is worried about her missing brother and is having to start a new school and learn a new language. Caylin looks after her mum, wishes her mum would look after her and feels like she is no good at anything. But they happen to be neighbours and an unlikely friendship develops. But Williamson writes the slowly-flourishing relationship in such a convincing way that 'unlikely' becomes 'blindingly obvious'. This is achieved by the back-and-forth nature of the story's narration. The girls take it in turn to tell their side of the story, the reader in the middle willing them both to discover their commonalities: they are both unknowingly looking after the same injured fox; they both love, and excel at, running; more importantly, they both desperately need a friend. With some very stark and honest passages, this book pulls no punches. Clearly Williamson believes that children can hack the reality - a racist criminal setting his dog on Reema for wearing her hijab is not just a fictional occurrence. For children to really grasp the desperate plight of those subject to racism in the UK, such parts of the book are essential. However, the book almost glows with hope and optimism, even at the moments when it seems like things can't get any worse. And it is not just empathy for Reema as a refugee that is important. 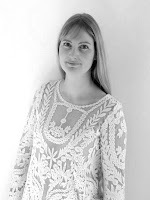 Caylin's character is written in such a way that light is shed on the background of a child in need; a child whose needs manifest in bad behaviour. Children with a more privileged upbringing need to empathise with children less fortunate than themselves just as much as they need to empathise with those fleeing violence and oppression (and so do teachers). This is a book that I wish every child would read. Politically and socially our children need to be living out the story in this book if the world is going to have any sort of peaceful future. The book's dual message that differences ought to be celebrated and common ground should be sought is too important for this generation to miss out on. Books such as this are a safe space in which to explore the everyday issues that children might face - we must get these books into their hands. I’ve been thinking, reading and writing a lot lately about how we teach reading strategies and skills in primary schools. I won’t bore you with all the details but thought I’d simply share some lessons that I’ve prepared for some year 3 teachers at the schools I work in. 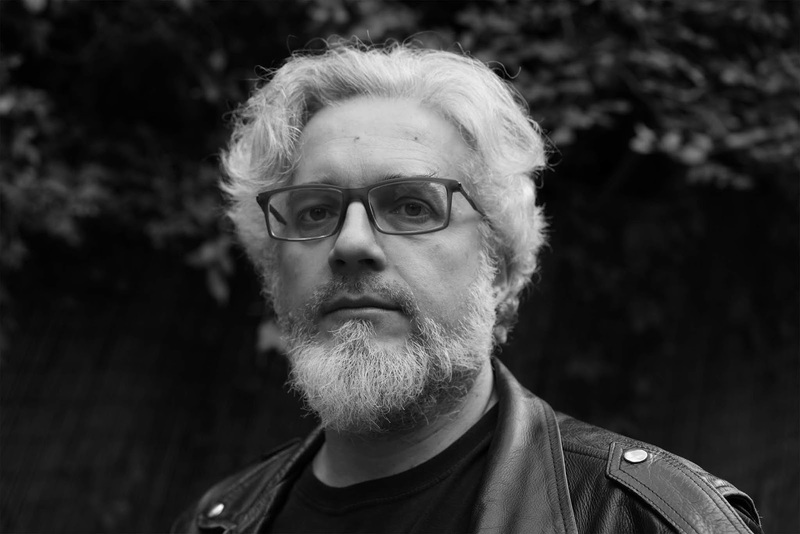 If you want to find out more about what I’ve been discovering, and the thinking behind the lessons I’ve planned, I’ve provided some links at the end of this blog post. These lessons, although not fully-formed (I didn’t want to dictate everything), are a good representation of how I think teachers should model the use of reading strategies and skills in a lesson and how children can be given practice of using the same strategies and skills that their teachers have modelled. The lessons involve both opportunities for oral and written comprehension activities; the written activity can just as well be worked on orally, although it is designed so that children can work on it independently by giving written answers. Some of the lessons you will see here were based on versions of Aesop's Fables written by Michael Morpurgo and illustrated by Emma Chichester Clark, published by Orchard Books. Although the book hadn't been chosen with inference-making in mind, it was serendipitous that there were plenty of opportunities to focus a few lessons on that particular skill. Hopefully these examples will show that, even whilst having a focus on a particular strategy or skill, other strategies and skills might be used in support whilst developing the skill which is the focus of the lesson (in this case inference-making). All of the above could be done as a whole class reading lesson, or as a guided group. The point of all of the above is to have discussions about the text and to orally develop strategies such as clarifying (what do the words mean?) and inferencing (why do the characters do what they do?). The intention is that children will then be better prepared to have a go at some similar questions themselves without the teacher having already answered them by way of demonstration. In this particular example the questions are focused around multiple choice answers with the hope that children will consider each option in order to decide whether or not it is good evidence for the character's motives. Notice that not all the questions are inference questions; other questions are asked which might support the child's understanding so that they are able to make the more difficult inferences (see my blog posts on scaffolding for more information on this idea). This part of the lesson could be done as an independent written activity or as part of a guided group. The multiple choice questions should spark some good discussion about why the correct one is correct and about the reasons children have for selecting their answers. If this was being completed as an independent written task there is the potential for a follow-up written task asking children to give their reasons for their selection. In the sequence of lessons on My Dad's a Birdman children spent 5 sessions focusing just on making inferences about character's actions followed by another 5 sessions focusing on making inferences about characters' feelings. For more on why there was such a sustained focus please read my blog post entitled 'Reading Comprehension: A Structured Way Of Teaching Inference-Making'. Along the way the children also exercised other reading comprehension strategies and skills in order to support their inference making and general understanding of the text. They also spent time just reading the book and enjoying - teachers and children alike kept telling me how much they loved the book. The fact that they had spent time completing such activities as outlined above enabled them to enjoy the book, rather than spoiling their enjoyment of it. See my blog post entitled 'Giving the Gift of Reading: Activities That Promote Reading for Pleasure' for more on this. Should We Teach Reading Strategies In Isolation Or In Combination?